Recent studies show that many seniors are having problems bathing without assistance. Getting in and out of the tub can be incredibly dangerous for older adults – even if their bathroom has safety equipment installed. According to research by the University of Michigan Health System, one-third of study participants had difficulties in the bathtub. “We found that there are a lot of independently bathing older adults who have trouble or are unsafe getting into and out of the tub or shower stall,” says lead author Susan L. Murphy. “For older adults, losing the ability to bathe is associated with having falls, fracturing bones, and even being admitted to a nursing home. It is important that we take steps to help to prevent bathing disability before it occurs.” One key way to help prevent accidents and injuries is by assisting seniors with bathing. This may be an uncomfortable situation for some family members, so a professional caregiver might be the best solution. Caregivers who use a reliable homecare system or homecare software, such as ClearCare Online, can refer to each client’s assessment for details on their needs and preferences. One of the major hazards for bathing seniors involves sliding glass doors. Three quarters of the study’s participants used the door for stability or balance. “This is extremely unsafe because shower doors were not designed to support a person’s weight,” Murphy explains. Caregivers can stand by, ready to lend a hand, for seniors that may lose their balance. A quick check in ClearCare Online’s homecare system and homecare software can alert the caregiver if the senior is a fall risk. Unstable handle bars or unsecured tub seats also pose a risk for serious injury. One study participant was actually using a plastic lawn chair as a shower seat. Others were using towel bars to climb in and out of the tub instead of a secure grab bar. Such unsafe practices can lead to falls and significant bodily harm. Because seniors are so resistant to asking for help, it’s important for family members and caregivers to take note of any such improvisations in the bathroom and suggest better safety measures. Asking for help with bathing is difficult for elderly persons because of the intimate and personal nature of the task. They may feel embarrassed, even ashamed. Identifying the trigger for the resistance can provide the caregiver with insight to creating a stress-free solution. Specific notes about the seniors’ preferences can be entered into ClearCare Online’s homecare system and homecare software. 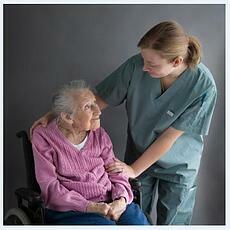 Any concerns or problems can also be noted in the caregiver’s homecare software. Older adults that resist asking for help with bathing may also hesitate to reach out for help in other areas of life. Perhaps they are no longer able to cook nutritious meals or pay bills on their own. Qualified caregivers can help with these activities as well. By using a homecare system to track all daily tasks, family members can view updates in real-time. ClearCare Online’s homecare system and homecare software have been designed to help seniors maintain their independence and enjoy living at home for as long as possible. If you have questions or would like to hear more, call 800-449-0645.